Hooray! 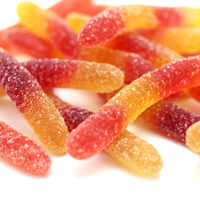 The first vegan gummy worm and all natural sour worm is here! Everyone can appreciate these fruity, pleasantly sour worms. They aren't as sour as some, so don't worry about your face getting stuck in a permanent pucker. Made with organic sweeteners. Click on 'Larger View" above to see packaging. Ingredients: Organic cane sugar, organic tapioca syrup, citric acid, pectin, organic grape juice concentrate, sodium citrate, ascorbic acid, colors added (organic black carrot juice concentrate, organic turmeric, organic annatto), natural flavors. I picked up my first bag today at my visit to the natrual grocery and now I am looking to order in bulks. I love gummy worms and will not ever spend money on store brand gummies. I am a Surfs Sweets fan and will recommend it to everyone. I wish that brands like surf sweets was avalible at your local stores because it is way better than anything you can get. These are so good!!!! !Because I'm a child who is allergic to a million things it's great for on the go snack or dessert.There so good I have to sneak them! These are a whole family pleaser. They are very fruity tasting and not too sour(but sour enough). The texture is much better than other gummies and doesn't get stuck in your teeth. Even my 14 year old son, who is a gummy connoisseur says they are the best. These little worms have a great, intense citrus flavor and are soft and perfectly gummy. They are not really all that sour so if you are looking for something more jaw locking - these will not fullfill that desire.